In Unepic you take the role of a young man playing a pen-and-paper RPG with his friends, but suddenly you need to use the restroom it's there that the lights go out and you find yourself in a dark castle which you assume must be a hallucination you then meet an evil shadow who becomes your unwilling companion trying to, in most cases get you killed. And all of this is in the first 5-10 minutes of the game! The story is fairly enjoyable and some of the quest givers that you'll come across clearly parody movies, anime, comics, and other media and tends to be quite funny. 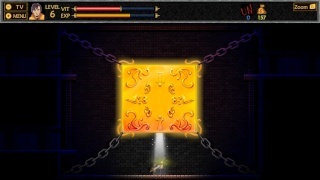 The game has you going through the massive castle doing typical platforming, while you light torches and fight enemies in Castlevania fashion. What makes this game different from games like Castlevania is that your character can level up and you can assign skill points so your character can equip stronger equipment, use better potions and magic, and increase his health. 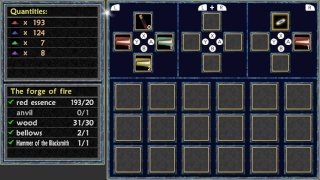 The game features a rock, paper, scissors approach as many enemies are weak against certain weapons while they are nearly invulnerable to others so your skill points towards weapon classes are very important and depending on the situation can seriously affect the difficulty of a particular point in the game. The Gamepad is utilized perfectly as an assymetric item shortcut menu which allows you to use items on the fly without having to navigate the inventory menu during battle which is a very good thing since you would likely die otherwise. The game is fairly difficult even on the easy difficulty setting so be prepared for a challenge, also expect to put a good deal of time into this title as it will likely take first-time players nearly 30 hours to beat making it a fairly lengthy title! Potion crafting is a very important part of the game as healing items are quite hard to come by and even though you can find healing items by killing certain enemies the drop rate of these potions are very low making this feature a necessity especially late in the game. Overall the gameplay is amazing, but whatever you do try to purchase the item to warp to the save/healing point as the game will be much more difficult if you don't. 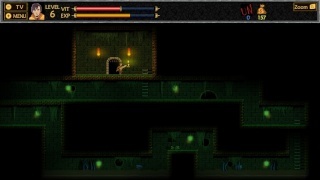 The graphics in Unepic look good albeit simple, which is expected in a old-school style platformer. The level design is quite impressive as well and will feel nostalgic to gamers who've played the older Castlevania titles and the enemies look fairly unique, especially some of the bosses. The game's voice acting is quite good, though it sometimes feels a bit flat, however the music is quite atmospheric and really adds to the overall experience! With great gameplay, a funny story at times, and amazing use of the Wii U Gamepad this game has alot going for it and the old-school graphics as well as the atmospheric soundtrack will immerse you in nostalgia heaven! This is a game any old-school gamer or platformer fan should add to their game library! This seems like a good game worth at least considering. I might have to put this on my wishlist now! @Rukiafan Thanks for keeping me updated on your progress with the game! It pretty much is in line with what i thought it would be. This and Chibi Robo have earned my money for my next 2 dl's! Great review and keep up the good work! @Tech101 wrote: @Rukiafan Thanks for keeping me updated on your progress with the game! It pretty much is in line with what i thought it would be. This and Chibi Robo have earned my money for my next 2 dl's! No problem guys and thanks for your feedback! This seems to be receiving positive reviews from most critics. Just two days till this releases here in Europe! That settles it I'm downloading this game! I downloaded this on Monday and can't stop playing when I'm home. It's a very addictive game! @KIBAxHINATA wrote: That settles it I'm downloading this game! You won't regret it because Unepic is an amazing game! Color me intrigued. I just might download this game soon. I'm definitely considering this game. The Star Wars references and Futurama character cameo appearance were unexpected and humorous.